We provide comfortable accommodation for you. Based houses 3 rooms and 2 bathrooms. Customer comfort is our priority. • Master Bedroom – queen-size bed, a wardrobe, a small table, ceiling fan, air-cond. • Second Bedroom – queen-size bed, a wardrobe, a small desk, fan wall, toto and extra pillows. 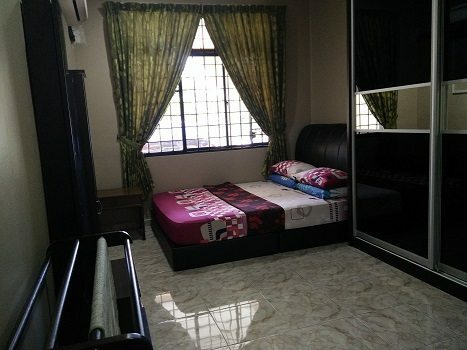 • Third Bedroom – single size bed, a small table, ceiling fans, hangers, iron with iron board. 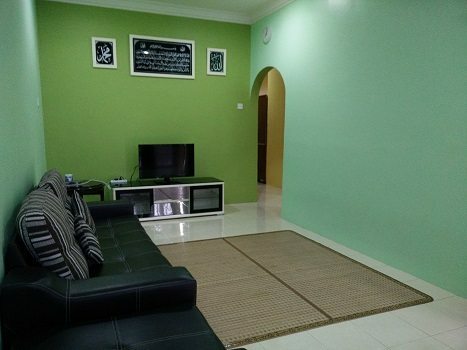 • The cozy living room is furnished with a sofa set, a fan coins, tv with Astro broadcast. 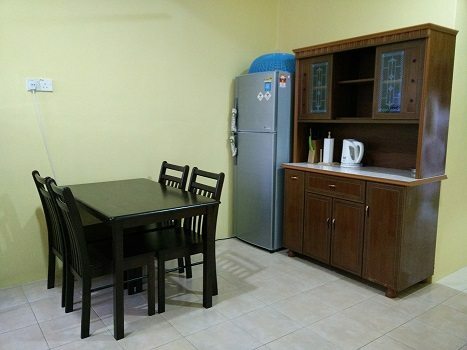 • The kitchen area is fitted with a refrigerator, rice cooker, kettle, set of dishes, stove with cooking utensils and a dining table. • Other: prayer mats and blankets. • Tenants can also bring their own if not enough toto @ for more comfort.